Welcome and thank-you for visiting our website today! Firstly, let me tell you a little bit about us. 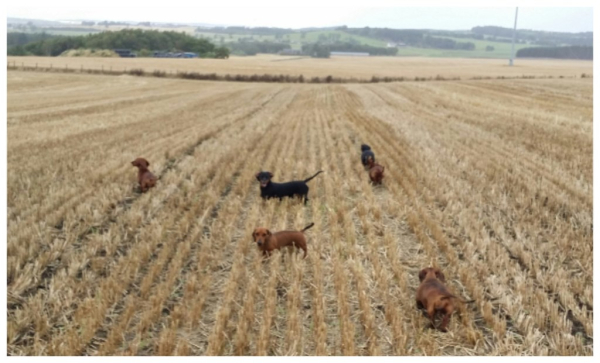 We are a small, family run kennel, based just outside Lanark in South Lanarkshire in Scotland. 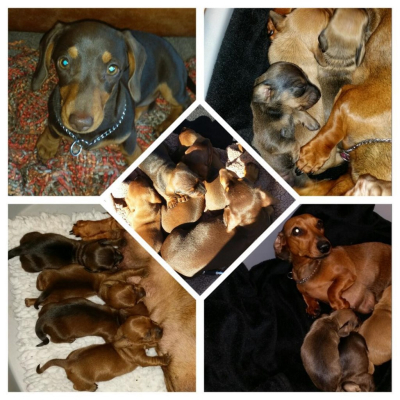 We have many years experience breeding miniature smooth Daxies-Red, Black&Tan, Brindle and Chocolate&Tan. 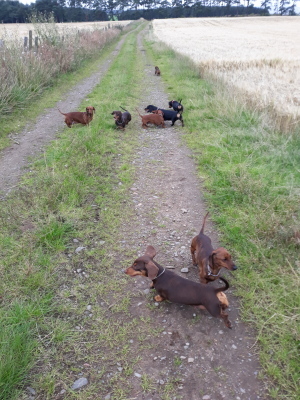 We have twelve daxies at the moment and each of them is unique and special in different ways.The "Our Daxies" page on our website has photographs of Effie, Francie, Josie, Myrtle, Hilda, Isa, Jessie, Isla, Mildred, Tilda, Jack and Victor- our dachshunds. 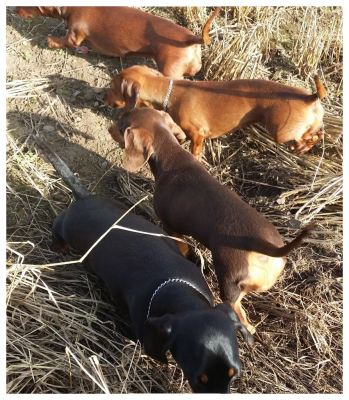 When we use outside stud dogs we make sure they have undergone the necessary health checks recommended by the Kennel Club and we use only stud dogs from breeders we trust and have built a strong relationship with. One of the most recognizable dog breeds on earth but how much do you really know about them? Check out the following facts and learn more about this amazing hound! 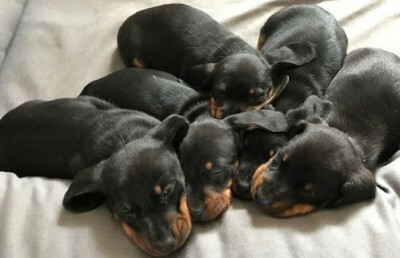 While you are probably used to seeing red, black & tan, chocolate + tan and dappled Doxies, did you know they come in 15 colors and 6 marking combinations? Colors include: black & cream, black & tan, blue & cream, blue & tan, chocolate & cream, chocolate & tan, cream, fawn (also called Isabella) & cream, fawn & tan, red, wheaten, wild board, black, chocolate and fawn. Marking combinations include: brindle, dapple, sable, brindle piebald, double piebald and piebald!!!!! 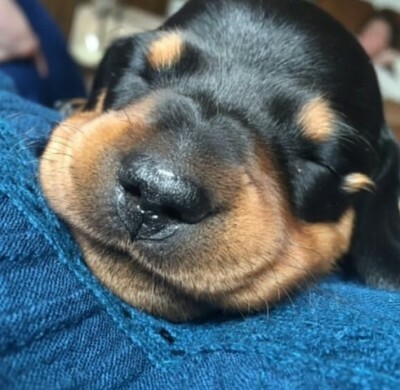 The name Dachshund comes from the German “Dachs” meaning “badger” and “hund” meaning dog. According to the AKC, Americans called the dog “Badger Dog” during the postwar years to disassociate the breed from his German origins. The breed became very unpopular in the post-war years! 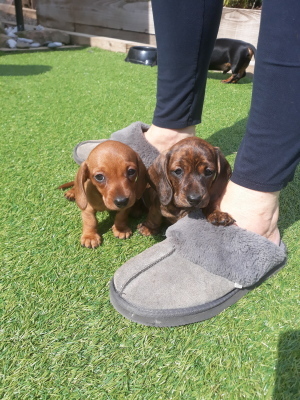 Many people are so used to seeing a miniature Dachshund, they forget that the standard size exist, and it can be almost triple the size of the mini. The mini is usually around 11 pounds and hunted small vermin while the larger, 32-pound dog hunted the badger. Kaninchen (German for "rabbit") is the smallest and is not recognized by clubs in the United States and the United Kingdom. 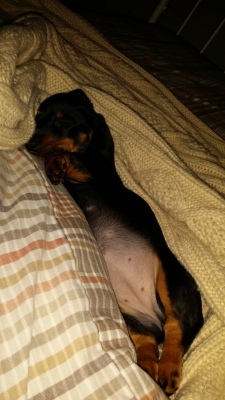 Queen Victoria is known for being partial to the breed, saying “Nothing will turn a man’s home into a castle more quickly and effectively than a Dachshund.” (GoodReads.com). She is credited for the breed’s popularity in Britain. Chanel, a Doxie living in New York, held the Guinness World Record for oldest living dog in 2009. She died at age 21, and then another Doxie named Otto briefly held the title. 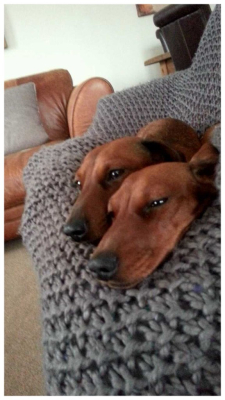 Doxies are known for living long lives, many into their late teens. This little breed LOVES to eat! They will eat practically anything! 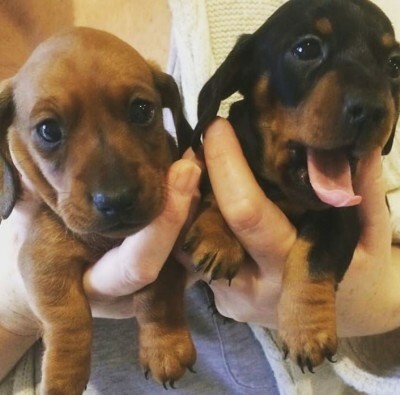 These two sites you will find endless information regarding every Dachshund. 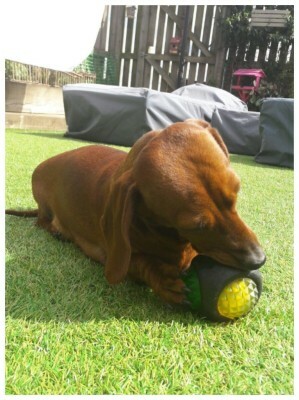 topic from buying and owning Dachshunds, health and welfare, breed standard and breed clubs. As with all dogs, there are some prevalent health issues within the breed that current owners, breeders and future owners must be aware of - I have provided clear and hopefully relatively simple advice in the "Health" page here. We hope you enjoyed our family! Enjoy the rest of our website and we look forward to hearing from you soon! We are happy to help with any query you may have.